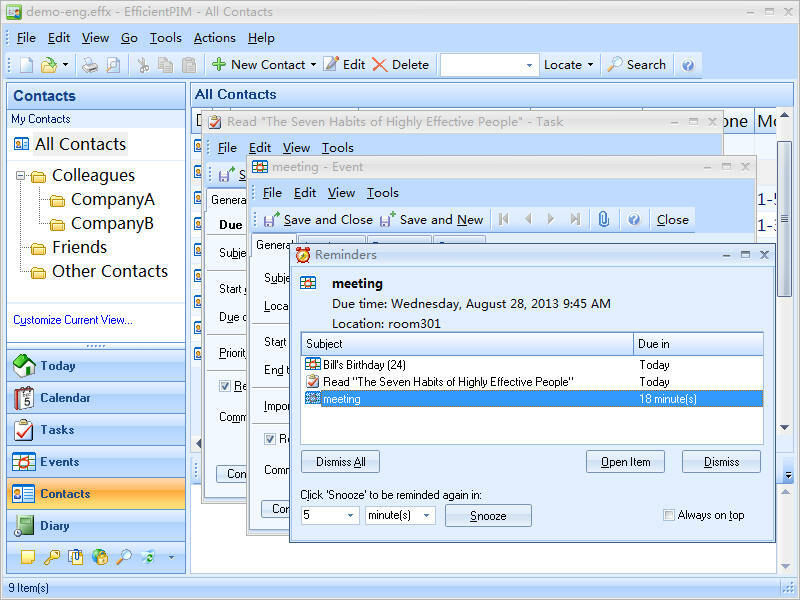 Efficcess is a full-featured and cross-platform personal information manager. Efficcess 5.22 was available as a giveaway on July 2, 2017! Efficcess is a full-featured and cross-platform personal information manager. It is the right information manager for you to improve efficiency and get organized! How would you improve Efficcess 5.22? Looks fine, great even! Just what I was looking for. Installed 2 versions: one on USB-stick and one on HD C:\ (entering same licence data for both). Seems to run OK on both installs. Have to do some extra checking to make sure all functions are active though. Thanks for this giveaway & 1 yr free updates guarantee. Looks fine, great even! Just what I was looking for. Installed 2 versions: one on USB-stick and one on HD C:\ (entering same licence data for both). Seems to run OK on both installs. Have to do some extra checking to make sure all functions are active though. Thanks for this giveaway & 1 yr free updates guarantee. I have tried mega PIM's and this is the first and easiest I've seen AND it sync's perfectly with my android phone! One gotcha is that the android version doesn't do recurring events like the PC version but will acknowledge them if done in the PC first. No problem here as most of my scheduling is done at the PC anyway. Installed on Win 7 64bit. 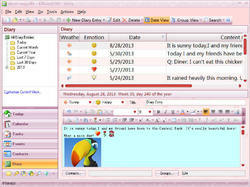 GUI interface looks like MS Outlook older XP version (could use an update). Also installed Droid phone app, used scanner on symbol installed from Google Play. 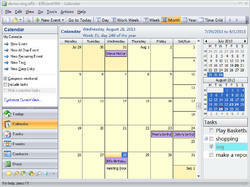 Input date info on calendar in phone, synced phone then PC on my wifi network and info updated to my PC calendar. I will work more with this program, but so far, I find it very useful and easy. Only thing need changing is the layout - (1) Phone app shows blank page - Grid lines would be better (2) PC Layout needs updating - interface is very dated. I wouldn't pay full price as is, but with updates, yes I would purchase at asking price. Installed quickly and easily. Registration accepted restart the program. Nice background themes to use. Lots of choices. Lots of features. Is somewhat glitchy on my computer. I put an item under Program Registrations, and the page closed before I could finish. All info lost. Too tired to do it again tonight. Maybe I should do an update. Love all the security, how you can password each module of the program and encrypt the main info. I will use the features that interest me, but would like to look around for a simpler PIM that is more stable. I do need one. I used the valentine theme so its cute inside. 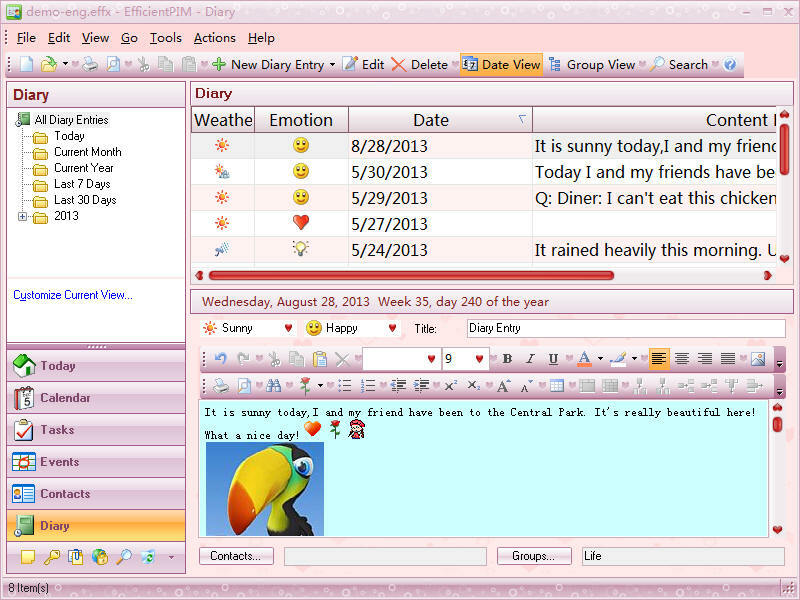 rich, I've been using this program and its kid brother, Efficient Diary, for years. Quick and easy to use. You can export data either as HTM or CSV. You can also print the diary (haven't tried the schedule). My version is lifetime. If you want a portable version, download it from the publishers website and use the same key from this giveaway. Their homepage shows a discount price of 50%... with LIFETIME UPDATES, instead of just 3 years. I had a program I loved and used for years.. still have it frankly.. but it does not work with Win10... It was named "Packrat Pro". It looked much like this one, simple and easy to keep track of Contacts.. You could printout all scheduled contacts, phone calls you logged, etc.. very easily. Never found another one as good.. the problem is.. these programs have their own data formats.. and one can export or import the info usually. Their homepage shows a discount price of 50%... with LIFETIME UPDATES, instead of just 3 years. I had a program I loved and used for years.. still have it frankly.. but it does not work with Win10... It was named "Packrat Pro". It looked much like this one, simple and easy to keep track of Contacts.. You could printout all scheduled contacts, phone calls you logged, etc.. very easily. Never found another one as good.. the problem is.. these programs have their own data formats.. and one can export or import the info usually. AND ALSO try ticking the Run as Administrator. It says 1 year free upgrade. Now I may be a little skeptical but does that mean it ceases to function after a 1 year upgrade or can you keep the current version for as long as you like? I would assume it means you can keep the old version after the initial update for as long as you want, but the 1 year free upgrade concerns me a little. Can someone from the company reply? BobS, maybe just do not update after a year. BobS, maybe just do not update after a year. Look at the settings. Easy-as-pie installation and registration on my Win7x64! I like this program a lot. I like the Windows-type tree organization, as well as all the tasks this will help me with. A real keeper. Thanks very much, GAOTD and Efficient Software! Installed fine. Registration info accepted with no problems. *Note: Registration does NOT involve e-mail. During installation, a box pops up to enter info. (The required registration info is in the read me file). Installed fine. Registration info accepted with no problems. *Note: Registration does NOT involve e-mail. During installation, a box pops up to enter info. (The required registration info is in the read me file). It's been over an hour, and still no email link. Two requests have done nothing. Pass. Mike OD, try a different e-mail. I had been having this issue and after talking with someone else we decided to try a different e-mail account. We both received the download link. I don't know what changed and I doubt we both had the same e-mail provider. Looks like a nice program. Installed but program would not accept the license. Uninstalled, downloaded again and installed again. And the program would not accept the license. Tried cut and paste, tried copying it manually several times and the program simply will not accept the license. Way too much time wasted on a silly issue. Uninstalled. One feature that distinguishes top quality calendars from the rest is the ability to have exceptions to recurring events. Example: See Juan the first day of each month, except for July 1. Google calendar can't do this; and it appears that Efficess can't either. Nice calendar. One feature that distinguishes top quality calendars from the rest is the ability to have exceptions to recurring events. Example: See Juan the first day of each month, except for July 1. Google calendar can't do this; and it appears that Efficess can't either. My mistake: it can make exceptions. After creating the series of recurring events, go to the date which is the exception and delete or change it. There is the option to choose just this date, or the whole series. What I was getting at is better described as an irregular series: I have physio appointments at 4 p.m. on July 4, 10, 16 and 21. My mistake: it can make exceptions. After creating the series of recurring events, go to the date which is the exception and delete or change it. There is the option to choose just this date, or the whole series. What I was getting at is better described as an irregular series: I have physio appointments at 4 p.m. on July 4, 10, 16 and 21. Bruce Fraser, GCal allows that too. You can delete or change individual days from recurring events once they're made. I use it that way for weekly appointments or meetups that sometimes get canceled. Bruce Fraser, You can do that in Google Calendar also. Hardgirl, if only notes are your needs, here's 2 others: All My Notes...you can also customize it to your liking/colors/etc. You can cut/paste a calendar into it if need be. This also appears on various freebie sites at times. Go to both sites and check them out. Hardgirl, if only notes are your needs, here's 2 others: All My Notes...you can also customize it to your liking/colors/etc. You can cut/paste a calendar into it if need be. This also appears on various freebie sites at times. You can also try Pimero, which does as described above; supposedly an Outlook alternative...free b4 u buy also... Go to both sites and check them out. 1 yr upgrade is very nice! Since it is from same publisher of Efficient Calendar, interface design is identical and I'm wondering what is the difference between Calendar and Efficess? 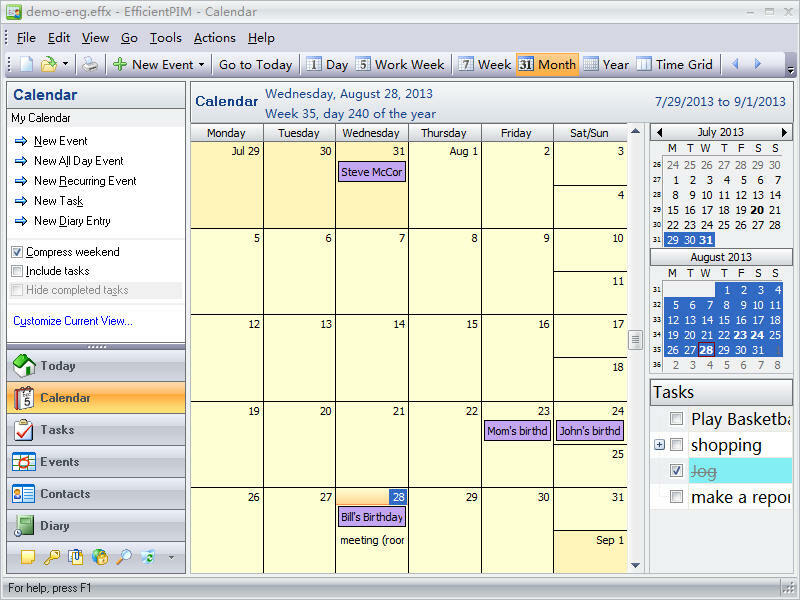 Efficess is full PIM and includes Calendar, Address Book, Notes and much more. 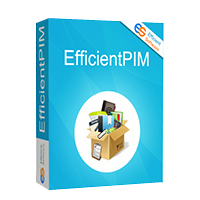 eta, See Comparison of Home Products at: http://www.efficientsoftware.net/comparison.htm Efficess is full PIM and includes Calendar, Address Book, Notes and much more. 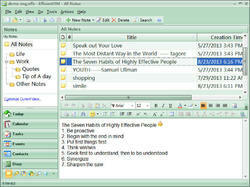 Friends of me use the previous version(C-Organizer Lite) for 5 years. 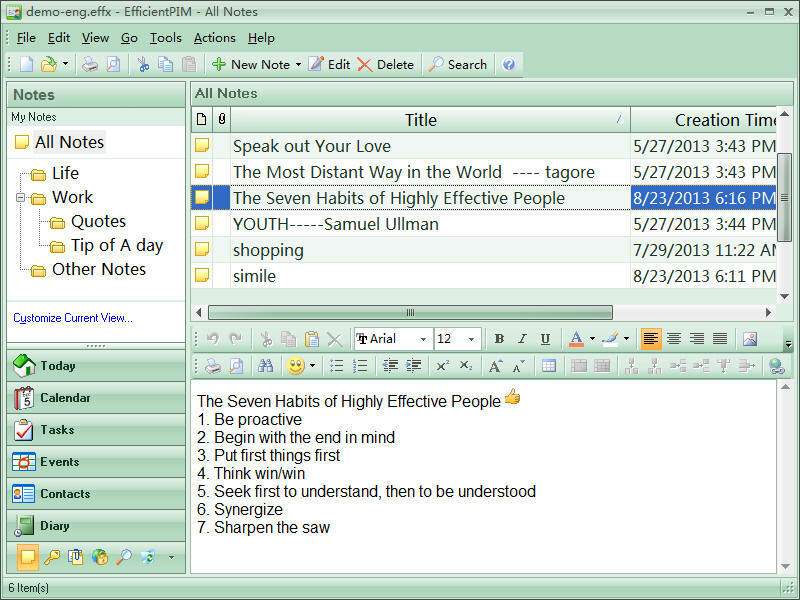 eta, The main screen of Calendar: https://www.dropbox.com/s/bgocq6i0if96lsr/Hoofdscherm.png In the first screen of today, you can see Contact and Diary: https://www.dropbox.com/s/bd7jjcn1870k00y/EersteStart.png I could import the database of Calendar in today's version: https://www.dropbox.com/s/c4visimd4ue5ro6/Import.png and: https://www.dropbox.com/s/24g3y61xdfglk1h/Import-2.png Friends of me use the previous version(C-Organizer Lite) for 5 years. R, Thank you for the link! 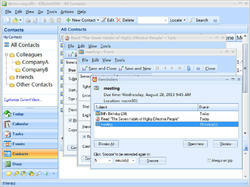 Is there any point to have this software for people using Microsoft Outlook? All right! And where is the readme file? Bettersafethansorry, All right! And where is the readme file? 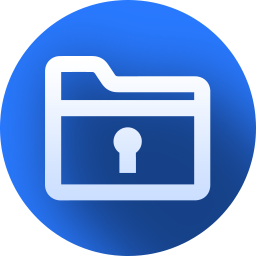 Balázs György, When you open the folder you downloaded, it ALWAYS contains a readme file, as well as the SETUP file. Thanks for the help! I found the readme file. M. Aronson, Thanks for the help! I found the readme file. 2) The Readme.txt file. "Readme" means "read me". Read it and you'll find what you need! Balázs György, The ZIP file you downloaded has two files in it: 1) The setup.exe file. 2) The Readme.txt file. "Readme" means "read me". Read it and you'll find what you need!